Tattoos may have become a popular style statement these days but there was a time when they were restricted to some specific groups only. Criminals and sailors were two famous groups who wore tattoos on their body parts. For criminals the tattoos were an identification mark that showed their allegiance to a particular group while sailors wore them to signify the risky life style that they led. The pirates also have close resemblance to the life of sailors and criminals. Therefore, leading a lifestyle similar to theirs is the secret fantasy of many. The legendary movie “Pirates of the Caribbean” also has a big role to play in making the pirates popular among men and women. Well, it is not possible in reality to become a temporary pirate but people do nurse the desire to become one and to get that desire fulfilled they get what is called a pirate ship tattoo etched on their body parts. A pirate ship tattoo displays the awesome pirate ship with the customary flag that is the identification mark of the pirates. Below we have presented 25 different types of pirate ship tattoos that will introduce you to their different aspects. Have a look. If you liked our selection, perhaps these other posts will interest you too, Thug Tattoos, Deathly Hallows Tattoos, Scorpion Tattoos and Swallow Tattoos. This pirate ship along with a crescent moon presents a romantic picture of the deep and beautiful sea. Cool pirate ship tattoo with skeleton bones pattern in the sky creates a badass look. The octopus lying at the shore and the ship sailing in the sea water stand for the cruel grip of pirates over their victims. A fabulous tattoo showing a black ship with a mermaid leading it into the water. Having a pirate’s life is adventurous and risky but worth it at the end of the day. This man was so enamored by the pirates life that he got a tattoo etched on his throat. Pirate ship along with roses and a skull carved below the knee brings out the frightening situations pirates have to undergo. The laughing skull and the sailing ship in troubled waters together symbolize the daring spirit of the pirates. Badass pirate ship tattoo that has a catchy touch and makes the arm beautiful. A creative pirate ship tattoo that frightens as well as attracts you to the life style of the pirates. A black and grey pirate ship sailing on the ribs brings out the darker shades of pirate’s life. This large and graceful ship sailing on the stomach makes for an evocative and pretty portrait. Created on the arm with a ship sailing in blue water and a cool pin-up girl, this tattoo looks quite charming. This boy shows his fascination for the pirate’s life through his tattoo on back of the palm. Red and black pirate ship tattoo, covering the arm, has a gorgeous look. A black outline of the pirate ship with their trademark flag that is a sign of danger on the sea. 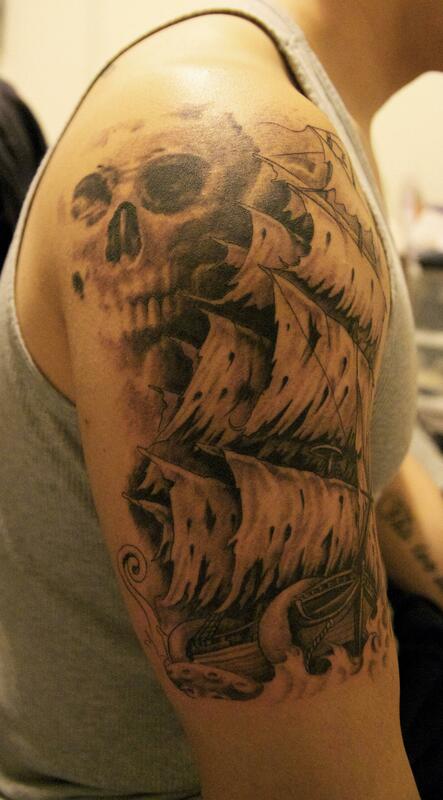 Resting on the ribs, this black and white pirate ship tattoo has a solemn, dark touch. Red pirate ship having a girl’s torso oozing from the front makes for an intriguing portrait. This sailor has got a pirate ship tattoo on his arm that expresses his desire to get back home as soon as possible. This somber pirate ship having worn out flag gels well with the contours of the curvy side. This tattoo piece having a large flag is a pointer towards the terror the pirates wield on the limitless sea waters. Black and grey pirate ship that stands for the desire to lead a free and courageous life. The desire to lead a pirate’s life may not be possible in reality but can get a shape through tattoo like this. Fantastic pirate ship tattoo with fine details that captures instant attention. Eye-catchy pirate ship tattooed on arm that has a vibrant and glamorous touch similar to the lives of pirates.